Your body fat percentage has nothing to do with your BMI. BMI or Body Mass Index is a statistical measure for populations only, not individuals. For example, if the government of this country wants to determine if a large number of the population are overweight, it would average out the BMI. You can take your BMI by dividing your weight by your height squared. Body fat percentage or body composition measurement is a very important and crucial aspect of any fitness program. Does Body Fat Percentage of Men & Women Differ? Even though men and women have the same muscles their average percent body fat differs. This is due to hormonal differences primarily. 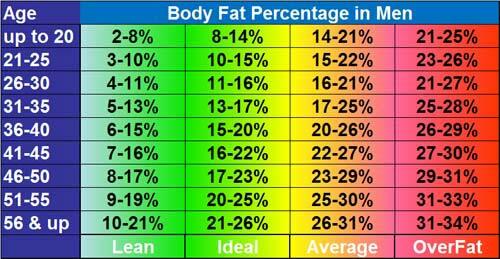 The following chart states different ranges of body fat percentage. If you are looking for information about women, please visit the women’s average percent body fat page. Generally, unless you naturally fall in this category you will not feel comfortable when your body fat percentage is this low. If your body fat percentage drops below the lowest level on the chart, you could run into serious problems. We have a level of essential fat. This essential fat is required for life, without it we would die. This is the category you want your body fat percentage to fall in. You will feel comfortable in your own body, look and feel best when your body fat is in the ideal category. Your body will have good muscle tone and definition. 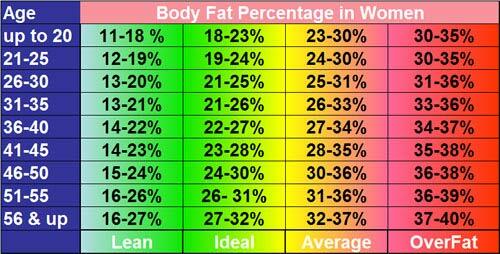 If your body fat percentage falls in the average category you will most likely feel good about your body weight, but probably want to lose a couple pounds and tone up. Some people whose body fat falls in the average category feel fine and don’t want to lose any body fat. You simply need to lose body fat. If you maintain an overfat body fat percentage for long periods of time, you run the risk of developing many health problems. Secondly you will not look your best when you have a high body fat percentage. If You are Not Happy with Your Body Composition Do you Have Many Options ? Many people who have tried to lower their body fat percentage have failed. The top method of reducing percent body fat is dieting. Unfortunately the diets which most people try are only short term solutions and they end up gaining the weight back. If all your diets in the past have failed you should check out some of the best diet options by clicking this link. Being on a diet is not the best solution. Diet should properly be referred to as nutrition. When the word diet is mentioned it is associated with a short term change in eating habits with the goal of losing weight. You can never underestimate why nutrition is so important. Exercise is the key to speeding up the process of lowering your body fat percentage. A combination of cardiovascular exercise and weight training will work wonders for your body composition and keep you healthy and living a long healthy life. Learn about your body fat and what you have to do to lose your unwanted flab with our large collection of exercise articles. 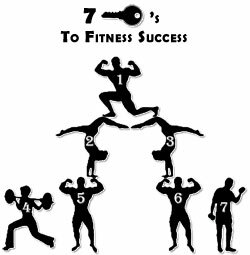 It is best to start an exercise program which aims at reducing percent body fat with a base of solid nutrition. If your nutrition program is good, you can determine if your exercise plan you choose is producing results more accurately. Cardiovascular Exercise should be the base of your exercise routine. Learn how there is many different ways to perform your cardio. There is also many different ways in which you can use the best cardio machines. Weight training can be very important to elevate your metabolism. You don’t need to get bulky muscles, building a couple pounds of muscle, can do wonders for your metabolism and make your cardio, and activities of daily living more efficient. AskTheTrainer.com is a great place to find all the information you need. If you educate yourself about exercise, nutrition and supplements, you will not get burned by false claims and useless products.